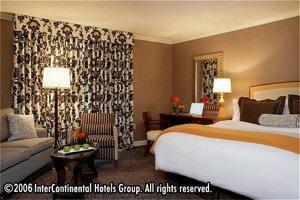 Choose from our wide selection of hotels located in and around Toronto. Whether you’re looking for budget hotels, resorts, or luxury hotels, you’ll find the best accommodations at the best prices. Stop wasting time and make your reservations online now! 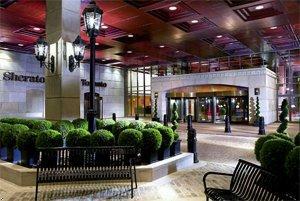 The InterContinental Toronto Yorkville resides in Toronto&regs most exclusive chic neighborhood. Explore this remarkable area of charming laneways, galleries, boutiques, museums, The University of Toronto, hospitals, and Queens Park. Experience design and comfort in true harmony at Hotel Le Germain, Toronto's award winning boutique hotel! Contemporary. Urban and Sophisticated, Le Germain is a pampering oasis in the heart of the city's financial and entertainment district. 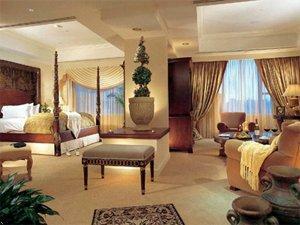 Its attentive staff goes all out to offer the very highest standards or personalized service. Located downtown at Bloor and Young Streets, the Toronto Marriott Bloor Yorkville offers deluxe accommodations close to the business and entertainment districts and just one block from the Yorkville shopping area. From the moment you arrive at the Metropolitan Hotel, you will feel welcome in an environment that is elegant, luxuriously hip and home to the finest dining the city has to offer. The friendly staff of the Metropolitan will attend to every detail, ensuring your stay is productive, comfortable, and ultimately satisfying. Suites are contemporary in design, some offering such features as large marble bathrooms with whirlpool tubs and upgraded bath amenities. Located in downtown Toronto, within walking distance of many attractions such as the Air Canada Centre, the Hockey Hall of Fame, Rogers Centre, the Harbourfront Centre, the Eaton Centre, St. Lawrence Market, Centre Island ferry docks , the financial di. strict and Union Station. Indoor pool, whirlpool, sauna, gym, restaurant, room service, banquet and meeting facilities. Centrally located at the landmark intersection of Avenue Road and Bloor Street and in the heart of fashionable Yorkville, Park Hyatt Toronto is the city's premium luxury hotel. With so much to do at our doorstep -the Royal Ontario Museum, fabulous shopping, world-famous sights such as CN Tower, Skydome, Hockey Hall of Fame, famous theatre distict, it is no wonder that Park Hyatt was named the luxury hotel of choice by Frommer's Toronto Guide Book. The Hotel features a Roof-top pool with a view of the Islands, CN Tower and the Skydome. 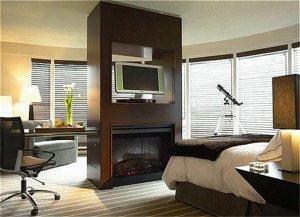 Located downtown overlooking Toronto Harbour and Island, offering superb views of Lake Ontario. Minutes from Skydome Stadium, CN Tower, Air Canada Centre, Convention Center, Harbourfront Centre, Business and Entertainment District. Featuring 2.5 acres of picturesque waterfalls, gardens, and terraces, the remarkable CAA/AAA four-diamond Sheraton Centre Toronto Hotel is a refreshing oasis among Toronto's downtown hotels. Our superb location in the heart of the city's theatre and entertainment district puts us just steps away from The Eaton Centre shopping mall and convenient to popular attractions. 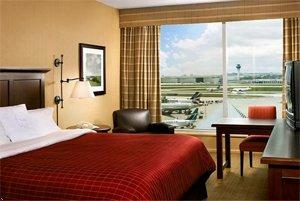 We are THE Toronto airport hotel for convenience. Our well-known climate-controlled walkway connects us to Terminal 3 at Toronto Pearson International Airport. Come and experience the ease of staying in the only hotel connected to the airport! Our new Sheraton Sweet Sleeper beds have arrived and with their pillow top feel, they are the talk of the town. Guests are raving about the quality of sleep and comfort they have enjoyed. The SoHo Metropolitan is simply Toronto's finest, whether you call it a luxury, boutique or design hotel. 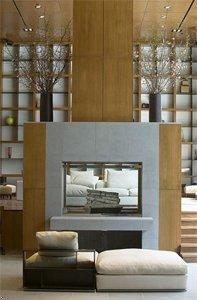 At once supremely indulgent and artfully subdued, the SoHo Met is a vibrant scene unto itself. From inspired culinary creations and rejuvenating spa treatments to advanced in-room technologies and innovative business services, a limitless range of sophisticated pleasures awaits you. A 20-year recipient of the CAA/AAA Four Diamond Award, The Westin Harbour Castle is a landmark in hospitality. Featuring a scenic waterfront setting, the hotel is located near major attractions, such as the Air Canada Centre, CN Tower, Financial and Theatre districts and the Eaton Centre.